It is time for an article on polypore’s and survival. For several years I have researched and studied how it grow, live and die. Some may wonder what medical abilities polypore’s got. It is something I know about without ever testing it. The only one that I can recommend is the birch polypore or Piptoprous betulinus. Here in Norway at this time of year you can see the last year’s fruit that still got some shape. You may experience to see a round ball forcing its way out from the bark and this will gradually in time become or get the bracket shape. Piptoporus betulinus contain natural antibiotics that can be used on wounds and infections. You can cut the skin or top of the bracket and use it as an adhesive plaster. It will work. The meat in this bracket is white and got a weird consistency and in this there are several abilities that can be used for tools and medical purposes. This polypore contains natural substances against corrosion. It’s been used since ancient times to store needles, awls and knives in. Elements from this bracket can be used for polishing and stropping the edge of a knife. The saying “kniv I kjuke” comes from this bracket. Maybe you can use the time now to look for the last year fruit that is still intact and take notice on it how it looks, then when you use this summer and late autumn you can look for fresh ones. They only live for a year usually. When a birch is infected by this then there is little hope for the tree. That is why I recommend not hurting healthy trees because it can get infected. Piptoporus betulinus continue its process until the tree is in small pieces and no longer can give nutrition for its rot process. After this the next evolution process sets in for the recycling. If you find a Birch Polypore then you can split it in two completely along the bracket to expose the meat. If it is clean and free from infections and insect then you can use it as a natural antibiotic. It likes some shade and areas with moist and wet conditions. That said I have found it in several types of terrain and you can find it in all kinds of strange shapes. It does not have to be a bracket shape and all. Typically a grown example of a bracket shape got exposed meat on top. It may appear summer until winter depending on area and places. It may also survive the winter! My advice to people is to do your own research and using books and articles is only a fragment of the knowledge. You must go in the nature and experience it. Go back time and time again on the same spot and see the development of it. 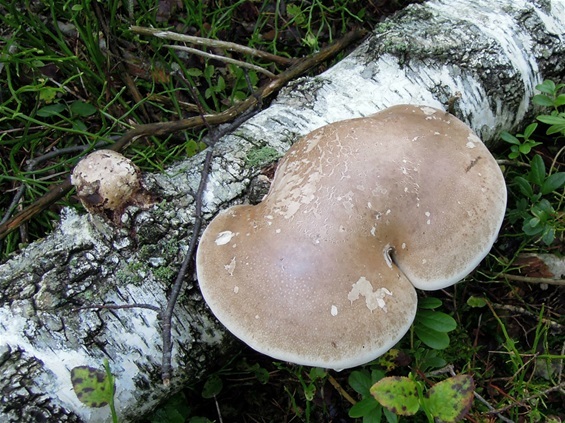 It is a powerful knowledge to know about the Birch polypore. It may appear with other polypore’s like Fomitopsis pinicola and Fomes fomentarius and more. The birch polypore infects living trees and when you see the ball coming out from the bark then there is a 100% guarantee that the tree is doomed. It spreads it spores with the elements, insect birds and animals. It is important for the recycling of the forest and to maintain a healthy forest. It is not dangerous to eat but it is considered uneatable. The remains of the rot process from the birch polypore have been used for several purposes and it got abilities and important factors for the forest. I have several other pictures of them and some are very picture nice too. They can be found in just a few centimeters wide up to 50 cm wide. Most polypore’s has been used in the history for tools, medical, coloring and the making of hats. Many of them will only have the effect of a tea.